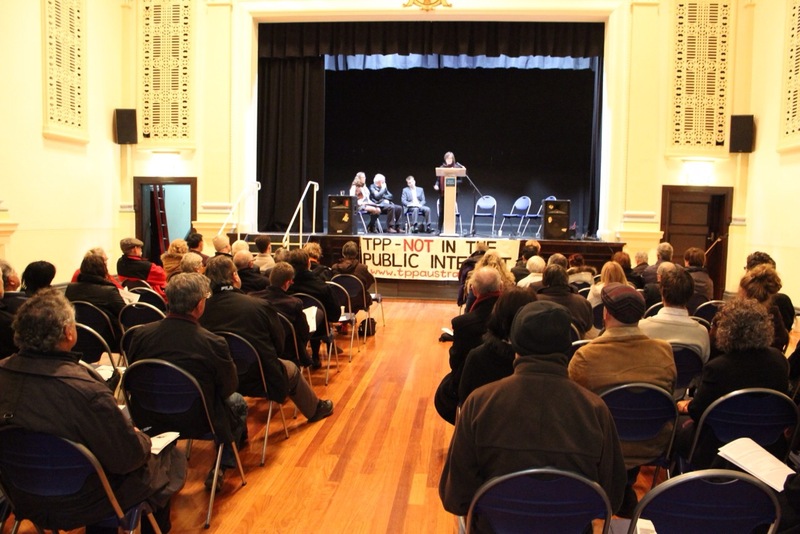 On Wednesday 20 August 2014 a public meeting about the looming Trans Pacific Partnership (TPP) deal has attracted heated discussion and debate from concerned residents in the bayside suburbs of Melbourne in Trade Minister Andrew Robb’s electorate of Goldstein. At the meeting three experts; Dr David Legge from La Trobe University, Tom Warne-Smith from the Environmental Justice Victoria and former advisor to the ACT government and Angela Daly from Swinburne University explored the potential impacts of the TPP including upon the cost of medicines, the ability of foreign investors to sue the government and internet privacy. Much of the concern was around a provision in the TPP known as Investor State Dispute Settlement (ISDS), which allows foreign investors to sue the government when laws or regulations are created which harm profits. “An important fea-ture of our democratic system is that the Parliament of the day determines what is in the public interest and how best to protect the collective interest of Australia and Australians. Giving foreign corporations the right to take legal action against Australia for decades to come simply because our politicians make a decision in the best interest of the people who voted for them is fundamentally offensive to most people’s basic expectations about how government should work,” commented Mr. Warne-Smith. The meeting was organised by members of TPP Australia; members of the Australian community worried about the implications of the proposed trade agreement. Images courtesy of RNA follower Jonathan Jennings. We the people of Australia, do NOT want this. Well of course, that is who created the secret, totally censored contents of the TPP (apart from a few snippets leaked by wikileaks) – a handful of international money/power financiers that totally control almost every nation’s central banks and thus governments, and those they don’t they simply go to war with (read FREE online short book by Major General Smedley-Butler titled “WAR IS A RACKET”. There is also a classic “Confessions of an Economic Hitman” that can be bought via amazon.com). Their frontmen, their lobbyists (aka ‘enforcers’) and a few politicians at the top of each government are the only ones to whom the TPP content is not totally secret. The lobbyists are rewarded handsomely by their corporate masters for pushing their secret agendas. This is not a conspiracy theory. This is simply, a conspiracy. Do not be fooled. This group of power hungry fascists are never satisfied – they always want ‘more’, and now they want nothing less than global power over all nations. Hence their UN AGENDA 21 enactment via one of their many power fronts, the United Nations, their intention of a global grid via their ‘smart’ meter rollouts around the world – their micro management tactics to micro manage every (microchipped) individual on the planet once they have completed their depopulation programs in this their so-called POST-INDUSTRIAL era. The TPP will ensure national sovereignty is finished and all the world’s natural resources as well as humanity will be under their despotic control. Unless and until we, the people get away from the mind-control TV with its spellbinding footy, soapies, fake news broadcasts etc, we are on the path to a living hell. Its in our hands. We do not have to go along with this grand plan of global totalitarianism. For information on what is really going on I highly recommend australians go online and listen to Leon’s commentaries and excellent, thought-provoking interviews at FAIR DINKUM RADIO – fairdinkumradio.com . The more Australians that wake up to the global plan of the handful of financiers, the more we will have the opportunity to resist and stop this insidious agenda. For those in doubt read Dr John Coleman’s “THE COMMITTEE OF 300” available at johncoleman.com and listen on youtube to an interview by ALEX JONES with successful film producer AARON RUSSO. Russo was befriended by Nicholas Rockefeller who spilt the beans on the financiers’ plans and invited him to join them. Being of decent character Russo declined the offer to join the CFR and was appalled, stating that every individual had the right to be free to be the best they can be, choosing to expose the agenda to the people instead (RIP). (also sold as an ebook and audio). More research has shown me that this Obama video has in fact used spliced sentences ie it is a fake. Pse be aware and disregard. Love your work, God alone.